Who Will Start at Shortstop?!? First- I know I said I would blog about Cole Hamels, but I decided not to. Besides resigning Jason Varitex the Red Sox have one more need, figuring out who will play shortstop. the Red Sox have two choices being, Julio Lugo and Jed Lowrie. Lugo played 82 games last season, hit .268, with one home run, drove in twenty-two, and stole twelve. Lugo also had a .945 fielding percentage before getting injured. Lowrie was called up after Lugo got hurt and played in 81 games, hit .258, with two home runs, drove in 46, and stole one base. One big difference is their age. Lugo is 33 while Lowrie is only twenty-four. Lowrie made two errors last season at third base which isn’t even his main position. Lowrie can play shortstop, third base, and second base. If you based the choice on stats Jed Lowrie would start. The Red Sox currently don’t have a utility man though. So since Lowrie can play three positions I would trade Lugo for a prospect and a utility man. I could also trade Lugo for a young catcher. The only problem with that is Lugo gets paid $9,250,000 and no team really needs Lugo. Lugo in one word is overpaid. A while a g there was a proposed trade that would have sent Lugo to the Tigers and Dontrelle Willis or Nate Robinson to Boston. Wills, who won the 2003 National League Rookie of the Year Award with the Flordia Marlins got sent to single A ball this season. This season he had a record of zero wins and two loses, had an ERA of 9.38, and had only eighteen strikeouts, in twenty-four innings. He also walked 35. One good thing about Wills, he is a high risk low reward type of guy so he will not becoming to Boston. He also will not come to the Red Sox because we have enough starting pitchers. I would put my money on both to share shortstop with Lugo getting a little more playing time. Also this is kind of random. Jed Lowrie needs a nickname. How about Jed the Jet? First- Manny and the Dodgers are still just talking. Second- Carlos Zambrano has to get LASIK eye surgery on his right eye. Third- Tom Glavine threw of the mound for the first time since shoulder and elbow surgery. Glavine, a free agent, is a low risk high reward player. I think he could come to Boston because of that and his long time teammate, Jon Smoltz signed with the Red Sox. More on that soon. Third- After the San Diego Padres signed David Eckstein the Texas Rangers want Omar Vizquel. Forth- Just a quick shout out to got milb? and District Boy who made my link list. Jason Varitex wants to stay in Boston and the Red Sox want him back. Jason Varitex meet with Red Sox owner John Henry, The meeting was requested by Varitex. They spoke one on one for 90 minutes. Varitex said that the meeting was “okay” as he put it. Varitex could have been lying because maybe he didn’t want the media to know about something. Henry had no comment. They meeting was just Henry and Varitex so that means Scott Boras, Teo Epstein, or any one else. Varitex, a switch hitter, turns 37 in April. Varitex hit .220, with 13 home runs, and drove in 43. He also threw out 16 runners and caught Jon Lester’s no hitter. Varitex managed to make the all-star game last season as the back up catcher. The Red Sox signed catcher Josh Bard this month. They also let knuckle ball catcher, Kevin Cash leave. Cash then signed with the New York Yankees. Varitex has been with the Red Sox for twelve seasons. 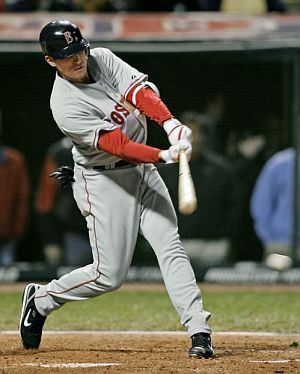 Derek Lowe, who recently signed with the Atlanta Braves, and Varitex were traded from the Seattle Mariners to the Red Sox in 1997. In 2002 Varitex caught Derek Lowe’s no hitter. Both had great seasons with the Red Sox. I hope Varitex comes back to Boston. I mean what other catcher has caught four no hitters? No one. Yes, he is getting old and he had a down year last season but he is a Red Sox legend. The city of Boston loves Varitex. Having Varitex go would be like Johnny Damon going to the Yankees. Okay, that was a little to dramatic. So Mr. Varitex if your reading this right now come back to Boston. Top Left- Hideo Nomo’s no hitter in 2001. Top Right- Derek Lowe’s no hitter in 2002. Bottom Right- Clay Buchholz’s no hitter in 2007. Bottom Left- Jon Lester’s no hitter in 2008. 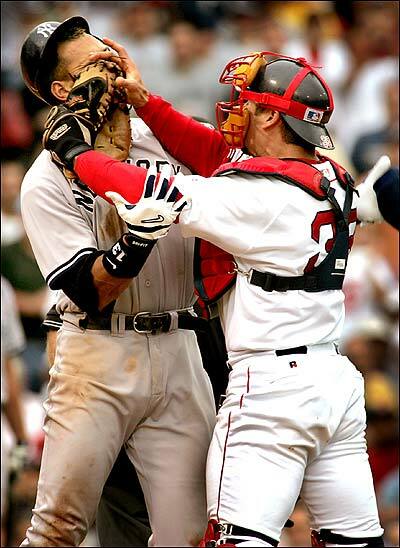 Varitex stands up for the Red Sox, I mean no glove no love. First- Since there is news to blog about look for Red Sox, Yankees, Rays to continue when there is no news to blog about or during spring training. Second- Milton Bradley signed with the Cubs pending a physical on a three year $30 million dollar deal. Look for more on that tomorrow. Third- Jason Giambi is expected to go to the Oakland A’s. Forth- Twins owner Carl Pohald died today. WOW! Is the hot stove heating up two all-star players are close to signing while one signed today. 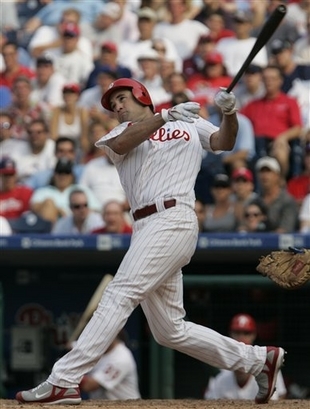 Pat Burrell signed with the Tampa Bay Rays today on a two year $16 million dollar contract. Pat the Bat won the World Series with the Phillies beating the team he signed with today the Tampa Bay Rays. Burrell is 32 and the right handed slugger the Rays have needed forever. Burrell is a veteran who can help the Rays this year. Burrell will probably be the DH with the A’s. Burrell walks a lot while he hit 33 home runs, had a .250 batting average and drove in 86 RBI’s. The move by the Rays kind of keeps them up with the Yankees who signed C.C. Sabathia, A.J. Burnett, and Mark Teixeira along with former Red Sox Kevin Cash. Burrell will help the Rays who know have to play with people watching them. Even with the signing Tampa Bay will not compete, because Longoria and others will have to make changes, which will give the Rays a not so good first month, half, or who knows it could take a week for Longoria to make his changes. Now that the Hot Stove is heating up maybe Varitex will sign with Boston soon. There is a new name to add to the list of Red Sox traitors, and that is Kevin Cash. The New York Post is reporting that the Yankees signed Kevin Cash to a minor league deal with an invite to spring training. Cash became a free agent after Boston non-tendered him. Cash played the last two seasons with the Red Sox. How can the Yankees afford anyone else! I mean selling tickets for a quarter. How are they going to make money to afford Tex’, C.C., A.J., A-Rod, Jeter, and now Cash. Yes I know Cash will not get payed 100 million dollars but still. Cash will join another Red Sox traitor Johnny Damon if he makes the majors and not AAA. Which I’m sure he will be the third catcher for the Yankees. He also could join another Red Sox traitor Manny. I don’t think Manny will go to the yankees probably the Dodgers. The Yankees have so many traitors to the Red Sox they should change their name to the, Traitors. Okay maybe that is a little exaggerated. The Red Sox need to find a catcher soon as maybe the sign Paul Lo Duca, a guy who could back-up or start, in case they can’t get Varitex. 4-It’s a test to see if he’ll do well.